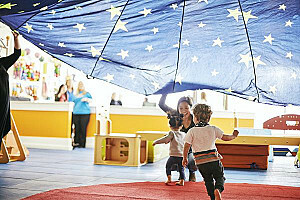 Gymboree Play & Music are the global experts in early childhood development programmes. Our commitment to quality is unsurpassed and every day thousands of parents and carers across the UK choose Gymboree Play & Music because they want the best for themselves and their children. Gymboree Play & Music offer classes utilising a unique and impressive combination of music, movement, props, imaginary play and custom-designed and patented apparatus, all to create a fun and magical world where children learn, thrive and most importantly have fun. We know that play is essential to brain development and social and physical growth; we’ve honed our expertise and sparked play and a love of learning with millions of children and parents for 40 years in 40 countries! Our whole-child approach centres around the 3 keys to learning: emotional, cognitive and physical. No matter their age, we design research-based classes with your child’s brain, body and expressive sense of wonder in mind. Challenging activities, original music, interactive experiences, and teachers who wouldn’t be anywhere else; all designed to ignite, excite and support children in a ridiculously fun, incredibly inviting, and super safe environment. Visit www.gymboreeclasses.co.uk to find out more and book your free trial!